Update 5/26/18: For RHEL 7.2 and newer, be sure to read the 5/26/18 update below as some of the steps below are no longer necessary. I spent some time this weekend working with vCloud Director 5.5.4 build 2831206 (on vSphere 6) and Red Hat Enterprise Linux vApp/guest customization. I’m not a *nix guru but I’m comfortable enough with legacy versions of RHEL 5 and 6 as I’ve worked with them quite a bit, particularly for vSphere applications and solutions such as vCloud Director to provide just one example. Quite honestly internet research or peer networking provides supplemental knowledge for whatever I can’t figure out. However I hadn’t spent much time with RHEL 7. There are some new twists and this blog post is an attempt to document what I’ve uncovered to answer questions and hopefully save myself some time in the future. If you’re in a hurry, skip to the “Tying It All Together” section at the end. When it comes to vSphere templates that I use myself, I’ll bake in commonly utilized software packages, patches, as well as tweaks and best practices. However, when it comes to shared vApp Templates in a vCloud Catalog, I employ more of a purist philosophy to minimize issues or questions raised regarding the DNA of the OS build I’m sharing with the organization which serves as their base starting point for their vApp. Aside from installing VMware Tools, my Windows 2012 R2 vApp is about as vanilla as it gets. The same can be said for my RHEL 5 and RHEL 6 vApps. When I applied that same approach to RHEL 7, that’s where some noticeable changes became apparent. The mere existence of this blog post stems from here. The default installation of RHEL 7 is a Minimal Install. While it’s not encumbered with extra software that may never be used depending on the server’s role, it’s also missing packages commonly installed in the past. Some of which are core dependencies in a virtualized datacenter. However, not knowing this, I gladly accepted the opportunity of a minimalist installation. And that’s exactly what I got. Without a Red Hat subscription (I fall into this category), or the networking means to reach your subscription on the internet, you’ll need to rely on your RHEL 7 DVD or .iso to install necessary packages such as net-tools mentioned above. In order to access these packages, you’ll need to mount the DVD and create a local DVD repository. An example of installing a yum package is shown above although it does not always require the use of sudo. Looking at the bulleted list above, a number of features are provided by open-vm-tools. 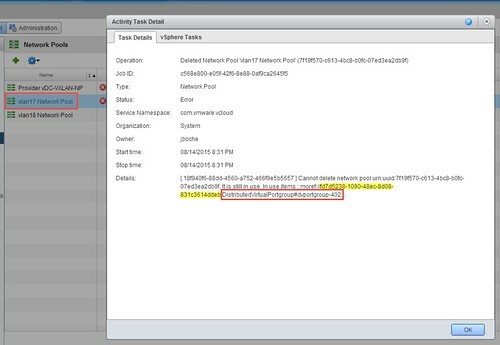 Unfortunately guest customization isn’t one of them (guest customization is typically used in deploying templates in vSphere as well as deploying available vApps from a vCloud Director catalog). At this point if you attempt to clone a RHEL 7 guest with open-vm-tools, you’ll get the exact same VM over and over again with no unique guest customization. The last bullet speaks to a plug-in architecture for which a guest customization plug-in is available from VMware called the deployPkg Tools Plug-in. Red Hat Enterprise Linux 7 Guest Operating System Installation Guide talks about the plug-in and while it appears to provide the installation instructions, it’s missing a few required steps for installing the VMware Packaging Public Keys so refer to Installing the deployPkg plug-in in a Linux virtual machine (2075048) for the correct process. In this process, yum will be used to install a package available via the internet from VMware instead of from the local DVD repository described previously. Launching deployment /usr/bin/perl -I/tmp/.vmware/linux/deploy/scripts /tmp/.vmware/linux/deploy/scripts/Customize.pl /tmp/.vmware/linux/deploy/cust.cfg. Deploy error: Deployment failed. The forked off process returned error code. The folder /usr/bin/perl/ does not exist. The RHEL 7 Minimal Install turned out to be a bit of learning process. A more streamlined approach, if available, would be to utilize the Infrastructure Server base environment during the RHEL 7 installation instead of the Minimal Install. Infrastructure Server is going to automatically include PERL and net-tools. It’s also going to expose the ability to install the Guest Agents Add-On. 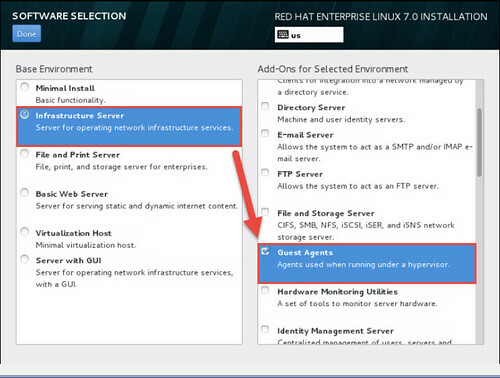 It’s talked about in full in the Red Hat Enterprise Linux 7 Guest Operating System Installation Guide. Installing the Guest Agents includes open-vm-tools from the RHEL 7 DVD without the extra steps of manually creating the RHEL 7 local DVD repository. While this is certainly more efficient, the one remaining caveat is that Guest Agents does not include the deployPkg Tools Plug-in from VMware. The plug-in will still need to be manually installed from the VMware repository if customization of the VM or vApp is required. For templates, this is almost always a necessity. One last note is that networking in RHEL 7 has seen some changes. For openers, legacy device names such as eth0, eth1, etc. are replaced by a profile name such as eno16780032 (the corresponding files reflect these name changes in /etc/sysconfig/network-scripts/). Menu driven network configuration (previously accessed from setup) has been replaced by a Network Manager which is accessible via nmtui (Network Manager Text User Interface), nmcli (Network Manager Command Line Interface), or Network Scripts. Also recall from the top of the article that the old standby ifconfig will not be present under a Minimal Install – it requires the net-tools package. Last but not least, detected Ethernet adapters in a Minimal Installation are not automatically enabled for use. Discovered Ethernet devices can be enabled during the initial RHEL 7 setup (I believe it’s under Hostname and Network), or it can be enabled after installation by running nmtui and check the Automatically Connect box for the appropriate Edit a connection menu. A detected Ethernet adapter listing can be obtained at any time with nmcli d.
In the end, there are a few different Base Environment types available with varying steps for building a RHEL 7 image which supports guest customization in vSphere or vCloud Director. Clearly the Minimal Install route has more steps while the Infrastructure Server route has less steps and is quicker. 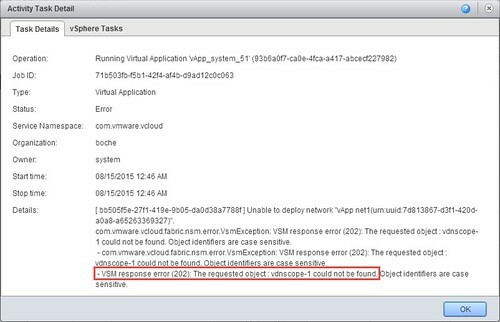 Regardless of Base Environment type, VMware does not recommend the installation of VMware Tools. I’ve linked several resources throughout this article. Just about all of the information was available, it was merely a matter of finding and reading the relevant documentation which isn’t always in one place. The only dots I had to connect on my own which I didn’t see mentioned anywhere was the lack of PERL for the deployPkg Tools Plug-in from VMware as well as for the installation of VMware Tools on RHEL 7 which isn’t recommended by VMware. Update 9/11/15: Brian Graf authored a nice piece yesterday titled Open-VM-Tools (OVT): The Future of VMware Tools for Linux which anyone who wound up here should find interesting. Update 5/26/18: As noted by daVikes in the comment section below (thank you daVikes! ), relevant updates have been made as of RHEL 7.2 which streamlines templates and guest customization even further. In short, deployPkg is included with open-vm-tools. Whether you choose to start with a minimal installation and install open-vm-tools afterwards, or you choose the Infrastructure Server and install Guest Agents (this installs open-vm-tools), deployPkg will be included with open-vm-tools. Do note that if choosing the Infrastructure Server method, downloading the two VMware Packaging Public Keys and creating the /etc/yum.repos.d/vmware-tools.repo yum repository is no longer necessary. I still make it a habit to follow the steps for Creating A Local DVD Repository For YUM.